Most people have experienced back pain sometime in their life. The causes of back pain are numerous; some are self-inflicted due to a lifetime of bad habits. Other back pain causes include accidents, muscle strains, and sports injuries. Although the causes may be different, most often they share the same symptoms. Sharp, localized pain in the neck, upper back, or lower back -- especially after lifting heavy objects or engaging in other strenuous activity. Almost everyone experiences acute back pain at some point in their life. A trip to the doctor is often an unfortunate result of a spirited soccer match or ambitious afternoon of garage cleaning! Acute: lasting less than 3 months. Most people gain relief after 4 to 6 weeks of home treatment. Recurrent: a repeat episode of acute symptoms. Most people have at least one episode of recurrent lower back pain. Chronic: lasting longer than 3 months. The term "lower back pain" is used to describe a spectrum of symptoms. Depending on the cause, lower back pain may be dull, burning, or sharp, covering a broad area or confined to a single point. It can worsen gradually or suddenly and may or may not be accompanied by muscle spasms or stiffness. Leg symptoms can be caused by lower spine problems placing pressure on a nerve to the leg. 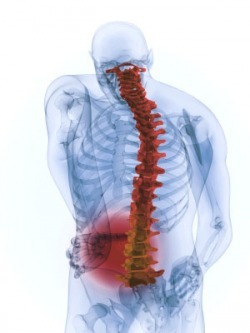 The symptoms can occur on their own or along with lower back pain. Leg symptoms can include pain, numbness, or tingling, usually below the knee. Weakness in both legs, along with loss of bladder and/or bowel control, are symptoms of cauda equine syndrome, which requires immediate medical attention.